What better way to inspire your team and get them thinking 'outside the square' than to get them to participate in some fun - and sometimes challenging - corporate team activities. Located within the Novotel Twin Waters Resort on Ocean Drive the purpose build Xperiences HQ offers a range of leisure and corporate activities for groups. After your session, you can relax and unwind in our unique and completely eco friendly outdoor venue. Xperiences HQ offers a wonderful venue hire experience for groups, nestled in nature with an enormous fire pit taking centre place. You will feel transported to another world within the beautiful and lush bushland surrounds, home to the wildlife of Queensland. The perfect venue for your next outdoor event, in the middle of our own private jungle is a Military Caribou plane that houses our reception and is also used for our Aircraft Xperience. 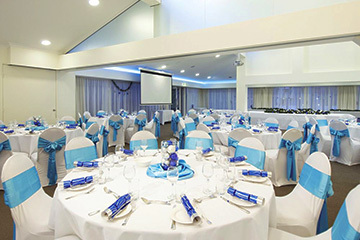 The venue is a great choice for conferences, product launches, presentations, business retreats and more. We can custom build at Xperience to suit your needs, that can also incorporate your company motto and products. We have over 10 years experience training the corporate and leisure industry - ranging from 20 minute conference ice breakers to outcome based team building programs. We can organise your catering needs, just ask our team. Any required audio visual equipment can be organised on request.